This breakfast skillet is what you need when it’s freezing outside and you’ve just come in from an early morning snowball fight! We don’t get an awful lot of snow here in Cambridgeshire so when we do get it we are out there first thing, making the most of it. I know some of you will laugh when I tell you that just a few cms of snow is enough for a snow day but that’s just the way it is here. I start this breakfast off by roasting up some crispy potatoes, I do this in the oven to make this a little quicker. You can, of course, fry the potatoes up in your skillet if you want but I find that can take a good while longer, and I usually don’t want to wait that long to eat this! So while the potatoes are roasting, cook up your veggies. Start with your onions, cook them up until they are nice and soft, for at least 10 minutes. Then add the pepper and mushrooms. I use spinach for this but kale works well too, it just needs longer to cook. Finally, add some eggs to your breakfast skillet, let these cook until they are to your taste. I like mine sunny side up and runny. Perfect for dipping those crispy little potatoes into. You can play around with the veggies, kale works well in place of the spinach. Chestnut mushrooms work well in this too. If you want to make this vegan all you need to do is omit the eggs. You could try serving it with some hot sauce too. 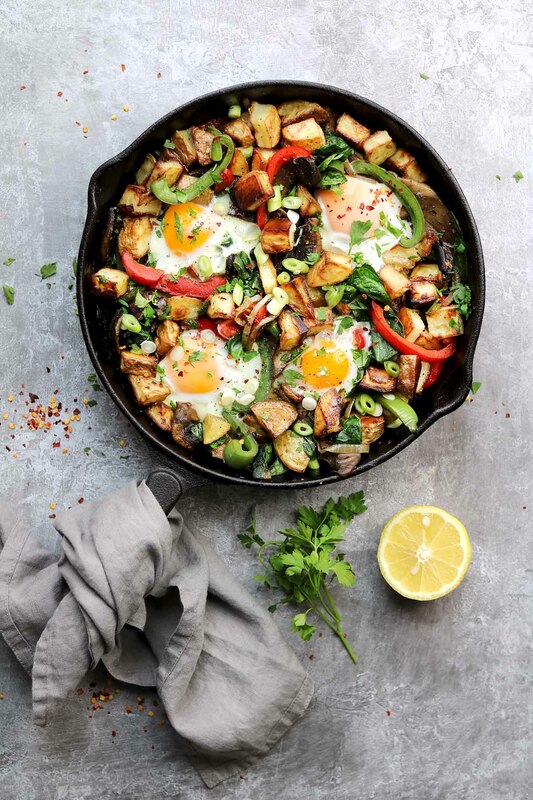 We like this breakfast skillet with some chopped parsley, lemon wedges, chopped spring onions and some chilli flakes. And if you are extra hungry some good crusty bread is nice too. 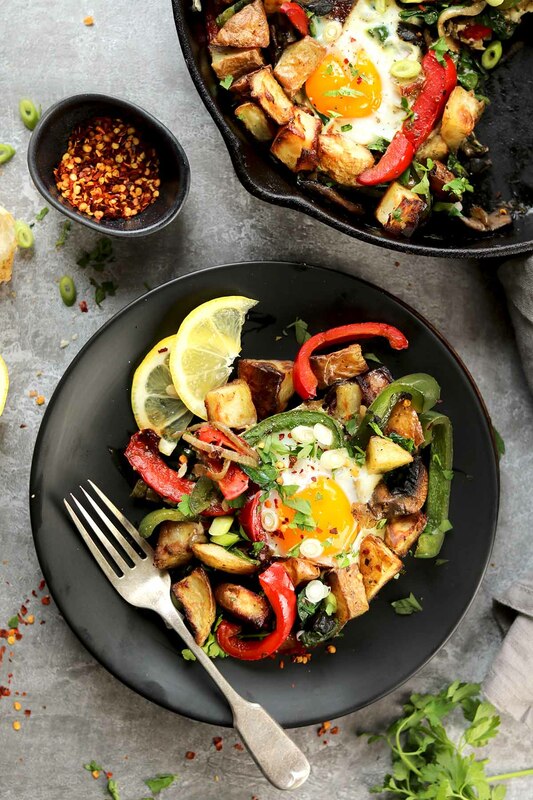 This breakfast skillet is exactly what I need when the temperatures take a dive. It’s cosy, warming and filling and will set you up for the day! Packed with veggies, crispy potatoes and lovely runny eggs, this is perfect for a cosy weekend breakfast or brunch. Or you could have breakfast for dinner and do it that way, there’s no judgement here! This would be totally acceptable for a light supper. 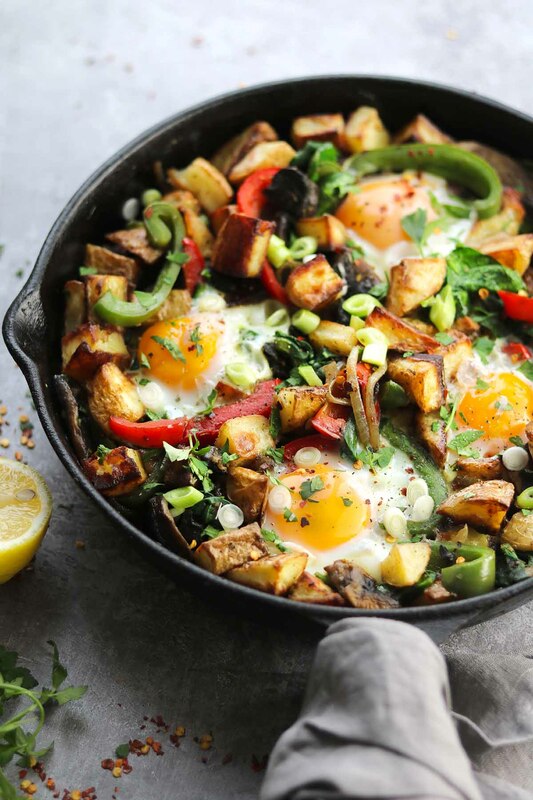 A jam-packed breakfast skillet with veggies, crispy potatoes eggs. Perfect for a lazy weekend breakfast or brunch. 450 g potatoes, scrubbed, skin on and cut into 2cm cubes I used Maris Piper, but any potato will do. Preheat the oven to 200 degrees C, 392F. I use an electric fan assisted oven, please adjust according to your own oven. Place the potatoes on a baking tray, pour over 2 tablespoons of oil add 1/4 teaspoon each of salt and black pepper. Toss well then bake in the oven for 30 minutes turning the potatoes halfway through cooking. While the potatoes are roasting, cook up the veggies. Heat the remaining oil in a skillet, add the onion and cook over a medium heat until soft, about 10 minutes. Add the peppers and cook for 5 minutes. Once the peppers are a little soft add the mushrooms, garlic, oregano, salt, pepper and chilli flakes. Cook for another 5 minutes. Now add the spinach, I add half first, let that wilt down then add the remaining spinach. Add the lemon juice and stir well. Once the potatoes are cooked transfer them to the skillet and give everything a good stir. Check the seasoning now and add more if necessary. Make 4 little wells in the skillet, break one egg into each well. Place a lid over the skillet, this will help cook your eggs quicker. Once the eggs are cooked to your own taste turn off the heat. Sprinkle over the parsley and chopped spring onion and serve. Serve with lemon wedges and more red chilli flakes if you like. Nutritional information is approximate and is based on 4 servings. I used a 25cm / 10 inch cast iron skillet. Any similar size pan will do. For this breakfast skillet I roasted the potatoes in the oven first to make this quicker, you can fry the potatoes in the skillet if you wish but it may take longer for the potatoes to cook. You can add any veggies you like to this, kale works well too. If you are serving this to young children or you are not keen on too much spice then you can omit the chilli flakes. To make this vegan, just omit the eggs. 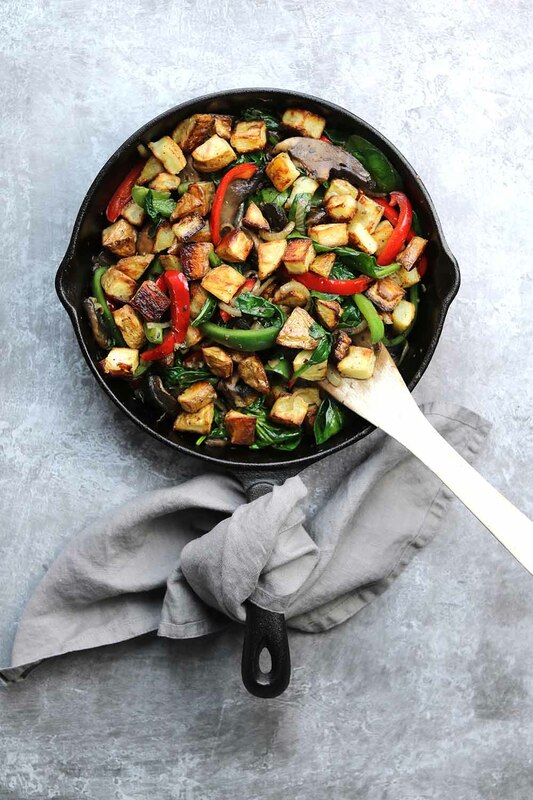 A delicious way to get your daily intake of veggies for breakfast! That looks so flavorful and delicious! I love all the veggies in this dish! I absolutely love this idea! What a warming and comforting way to start the day. Stay warm! Amazing Breakfast platter and so healthy too. Love the combination of veggies too. Full of nutrition and health for the day. I’m a sucker for a good breakfast skillet. This one is speaking my language! Also, your photos are beautiful! I can’t wait to make this! I love love hearty breakfast platters. So does my son! His teenage eating habits never went away. This will fill everyone up, and him! Wow! I really wish I had this for breakfast this morning. This looks like the breakfast for champions! 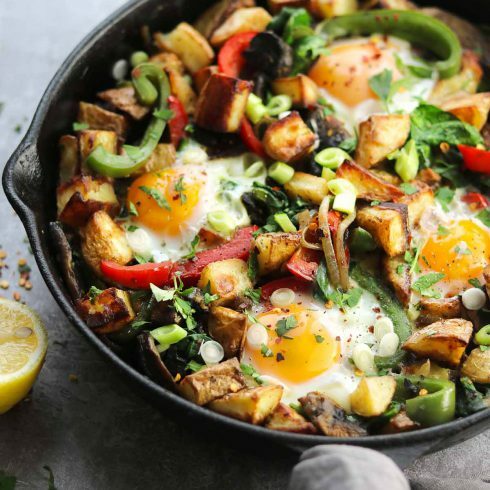 I want this loaded breakfast skillet for breakfast every morning! Looks so good and a great way to start the day on a full belly. I’m so guilty of making the same things for breakfast and this recipe looks like the perfect switch up I need!!! Looks amazing and so healthy!! Wow this looks really delicious. I absolutely love the flavors and colours. It’s loaded with so many healthy ingredients. It’s perfect breakfast . Can’t wait to make this.